Trace the station molds onto a 12 mm particle board or plywood. This can be done in many ways - this is one: cut a small hole (3x3 mm) in the drawing where the centerline and waterline meets and small holes on the waterline extreme left and right. Draw a waterline and a centerline on the board, using the edge of the board as baseline. Position the plan correctly over these lines and mark the station perimeter with an owl. Flip the plan over, center it over the lines and mark the other half of the station. Remove the plan and draw the station by connecting the marks. Draw the centerline and waterline. Mark the sheer. Draw a new centerline on the board and continue with the next station, until all molds are done. Cut the molds with a sabersaw or bandsaw - following the vertical lines to the baseline (leave the deck for now). Draw the stems in a similar way, marking the waterline. As with the molds leave material to the baseline - it is easier to attach the stems if the can rest on the strongback. There are in principle two ways to strip a kayak or canoe: using bead-and-cove strips, gluing the strips one at a time with carpenters glue, and using square cut strips, working epoxy into the seams afterwards. The end result is functionally the same with slightly less visible seams with the bead-and-cove method. For the first method buy milled and routed strips - doing this yourself is a tremendous waste of time, unless you have a fully equipped professional shop. For the second you only need a handheld circular saw with a fine toothed furniture grade blade. The strips should be approx 18-20mm x 5mm. Wider they resist bending, narrower there are more seams to fit, which takes time. The length is not important since scarphing is very easy and quickly done. Look for boards with as few knots as possible and reasonably strait grained. But above all - look for low density. When you calculate boards, remember the blade takes 2-3 mm for every strip. Check the adjustment of the saw: 4,7 mm is OK but 5,5 is unnecessary thick. Moisture content is not critical - when the strips are cut, a day or two in the shop will have them dry enough for building. The number of strips required depends on hull type, length, beam etc but approx 75 strips for a kayak and 60 for a canoe is a reasonable approximation. Some 30% of the strips are full length (as is or scarfed), the rest is decreasing length. I prefer using a handheld saw instead of a table saw. Moving a small saw along a stationary board is easier than moving a 5 meter board over a stationary saw, with less risk of breaking the thin strips. Attach the board with thin nails to a couple of saw horses, adjust the fence, put the ear plugs in and get ready for a couple of rather boring hours. The odd strip may be waste when the saw wobbles because you happen to stand on the cable. But it doesn´t matter much - you will need a lot of short strip pieces before the kayak is done. Do not bother planing the strips. First it is unnecessary work as you will have sanded every square inch before the hull is done and secondly: there is a risk of smashing the strips when the blade hits knots or other imperfections in the strips. Especially fir is notorious for deceptively hard knots. As stated above I do not think routing is a good idea. Too much work compared to the expected advantages, and with normal amateur shop equipment it is hard to maintain the precision needed - and without perfect precision you are far worse off than with square cut strips. So my recommendation is: cut and start building - or buy professionally milled and routed strips. 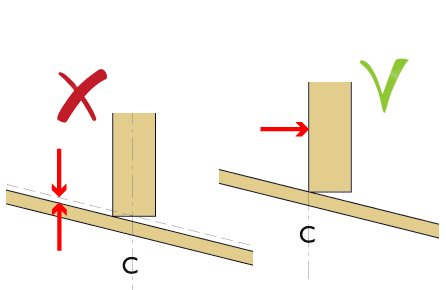 Bead-and-cove strips may result in almost invisible seams ("may", since the odd imperfection will show up against an otherwise perfect surface like the proverbial sore thumb). Square cut strips will show seams as thin (typically 0,1-0,2 mm) slightly darker lines. Not unattractive since they are even in thickness and follow the sheer like on a carvel built yacht. An alternative way to invisible seams is to use a small plane to adjust the angle of each strip. Is routing an unavoidable temptation? Visit One Ocean Kayaks web site for instruction. Time to prepare a strongback. This can be done in many ways. The only requirement is that it provides a stable surface for attaching molds and stems. This is my favorite: two long 1x6" boards with ends nailed together, a spreader inserted in the middle and the hole construction positioned on a couple of saw horses. The length approx the hull length and the width a couple of inches narrower than the hull is optimal. A string tensioned along the strongback will be a reference line for attaching the molds. Check the strongback using a spirit level - it is easier to get the molds correct if the strongback is horizontal both ways. This is one of the two critical tasks, where a little extra care will pay off (the other being sanding). Measure and mark the mold positions on the strongback. Attach short crosspieces of 1x2" at the marks like this: stations 1-6 with the aft edge against the mark, stations 7-12 with the front edge against the mark (the reason for this is to avoid having to plane the outer edges of the molds to an angle). Attach one mold at a time with a clamp against the crosspiece: mold 1-6 aft of the 1x2", 7-12 forward of them. Adjust them vertical and horizontal and make sure the are positioned exactly over the reference string. One neat way of doing this is to drill a small hole (4-5 mm) in all molds where the centerline and waterline meets - then a lamp at one end showing through all the holes will have all molds positionen in a straight line. Normally the edges of the molds are taped to prevent excess glue to stick to the molds, but lately I have come to regard this as an advantage: the strips are held perfectly to the molds with no risk of staples becoming loose during the work. When the hull is finished it is easy to tap the molds loose and to sand away the small pieces of particle board that may adhere to the inside of the hull. Every mold is adjusted in three dimensions - sideways (left-right), height (up-down) and angle (vertical-horizontal). I start with a spirit level to ensure the waterline is horizontal. Then I tap the mold sideways to position it exactly above the reference string. A precision of +/- 1 mm is enough since more accuracy takes unproportionally long time, and this is within the tolerance of a normal draw and cut job. Make sure that any small inaccuracies are divided randomly to both sides - consistent curves in the spine of the kayak may lead to paddling in circles. At last I check the height, adjusting the molds so the keel is a smooth and even curve without bumps. Check with a batten or strip, held at different positions along the bottom of the hull. When you are satisfied, fix the molds with a couple of screws into the crosspieces. The inner stems are there to give the correct shape to the stems - they do not contribute much to the strength in the finished hull. The dimensions are therefore not critical. Sawn stems (most kayaks): cut the stems (fx from fir or plywood, 8-12 mm thick) and attach them in the position given by the plans and the waterline mark on the stem. On most hulls the stems terminate at mold 1 and 12, but on kayaks with long overhangs the inner stems may be let into mold 1 and 12. Laminated stems (Canoes and a few kayaks with short stems): cut thin (approx 3 mm) strips 1 meter long. Laminate four of these (glue with thickened epoxy) over a particleboard mold. Shape the stems, creating a large gluing surface for the strips. Draw a centerline along the stem. Hold a strip to mold 2, 1 and the stem and mark the angle. Plane to the mark, leaving the centerline intact (it is your reference that the profile remains correct). The stem will be pointed at the sheer but open towards the keel. Jag är väldigt sugen på att bygga själv. Hur lång är en kajakmed tanke på lokal och material. Jag har möjlighet att beställa brädor utan kvist och fullängd på ett sågverk. Jag kommer att bygga kajak för nybörjare med god stabilitet. Knske senare även 2-mans. Kajaker varierar från drygt 2 meter för en kort forskajak och upp till nära sju meter för en lång tvåmanskajak. Merparten kajaker för turer till havs eller i sjösystem hamnar mellan 5 och 5,5 meter. Har du en begränsad plats att bygga på får det naturligvis styra, men annars är egenskaperna det du skall fokusera på. Läs på kajaksidorna och välj. Kanske vore det på sin plats attpoängtera att innerstävarna bör fixreas ordentligt i jiggen. Vid vårt Njordbygge drogs den bakre fastskruvadeinnerstäven loss från jiggen av spänningarna i ribborna. Det fixade sid trots allt, men då genom att vi satte klossar på ömse sidor av stäven och skruvade med flera skruvar. Även den främre stäven hade vi fäst för dåligt. Vid nästa bygge kommer vi att se till att stävarna är ordentligt och stabilt förankrade i jiggen. Hej. kan man bygga en roddbåt eller mindre motorbåt av ribbor och epoxy? isåfall, blir det billigare än om man bygger med plywood? Alla båtar oavsett form, storlek eller användning går att bygga i stripteknik. Ofta blir det billigare än med plywood, eftersom plywood kostar mer än granebrädor för samma skrovyta. Men om du använder billig plywood och inte klär den med glasfiber/epoxy – och därmed accepterar en underhållskrävande och kortlivad båt – kan du komma undan billigare än med strip. Håller på med innerstävarna på en Smart. För att få relingsribban konvex i ändskeppen ser det ut som att stävlängden måste kortas ca 10 cm. Men enl ritning skall stävlängden vara samma som spantavstånden. Vad är det som är galet? Jag vet inte vad som blivit fel, men det är oftast tämligen enkelt att åtgärda. Använder du 5 mm granribb är de styva nog även om du inte häftar dem mot spant 1, utan låter dem få en naturlig form. Ett annat alternativ är att flytta fram spant tills det stämmer (men då får du ha koll på att det inte blir fel i köllinjen). Det kan låta som om sådana åtgärder kompromissar med formen, men volymen ute i ändskeppet är så liten att några menliga effekter varken går att mäta eller märka. Skrovet är ritat med mjuka harmoniska kurvlinjer, och därför är ögonmått en utmärkt indikator på att allt är rätt. Bestämde mig dock innan ditt svar att göra innerstäven kortare då spant 1, 2, 3 är enl ritning och sitter med rätt delning. Nu är däcksribborna på plats och däckslinje samt bordläggning ser harmoniska ut. Ser du några problem med kortade innerstävar? Nej, det finns inga problem med det. Som jag nämnde är volymen så liten i stävarna att deras utformning huvudsakligen är en estetisk avvägning. Ser det bra ut ut är det bra. Hur är det att såga ribborna med en bandsåg i stället för med handcirkel. Handcirklandet tycker jag var ett av de besvärligaste skedena i mitt första bygge. Jag har bara en liten bandsåg för finsnickeri så för mig är det inget alternativ – dessutom tycker jag att handcirklandet är ett enkelt och effektivt, om än tämligen tråkigt jobb. Men prova! Om man däremot är begåvad med en bordssåg, då blir det en annan femma. Då kan man såga flera till många lister på en gång, med sk multimonterade klingor. Och då har man kanske en rejält stor verkstad. Proffsvarianter kan ta 5-6 klingor, vad jag sett. Byggsnickarnas varianter kan ta ett par stycken, fast en del kräver litet modifikationer. Dragit igång mitt första bygge, en Frej. Liten fråga om spantmallar. När du skriver att 1 - 6 skall vara akter om spanten, och 7 - 12 skall vara för om spanten. Om jag mätt ut enligt beskrivning för en vanlig 507, skall jag hålla 39 cm mellan. Skall jag ändra mellan spant 6 - 7 så att det blir 39 cm? För om jag mätt ut allt i förväg blir måttet mindre mellan spant 6 - 7 om ja ändrar akter till för om linjen. Det rör sig om tjockleken på spantet (15 mm), blir detta ett problem? Monterar du spanten centrerat över 39-cm markeringarna måste du fasa kanterna på alla spant i ändskeppen för att inte kajaken skall bli för "tjock" i för och akter (bild). Gör du exakt som det står i manualen slipper du det. Och, ja, det är spanttjockleken det handlar om. Ställer frågan på två ställen, antar att fler kan hitta och få hjälp med sitt bygge så. Håller på att bygga en Frej som jag köpte för några veckor sedan. Jag insåg när jag sågade ut mallarna i plywood att sticksåg inte är det verktyg jag är mest hemma med. Du skriver att de moment som kräver noggrannhet är uppsättning av mallarna i jigg och slipning. Men med vilken precision och vilka toleranser måste man såga ut spantmallarna, dom är väl ändå avgörande för resultatet? Jag är väl nu uppskattningsvis som värst +-2-3mm från ursprungsmallarna. Dom ser delvis lite ojämna ut. Felaktiga spant ger såklart samma fel i skrovformen som misstag vid monteringen av dem. +-2-3 mm låter mycket. Plus är förstås inget problem, bara att slipa ner till linjen. Men minus är svårarer att reparera. "Tricket" är alltså att såga med marginal och slipa in till linjen efteråt. Det handlar förstås också om sticksågens kvalitet. En gammal utsliten sticksåg innebär glapp som får bladet att vandra i sidled. Använd ett nytt fräscht grovtandat blad avsett för trä – ett slitet eller böjt blad gör det svårt att få precision. Kolla att styrtrissan är rätt justerad – för lång ifrån så vibrerar bladet, för nära så slits styrtrissan ut. Kolla att pendelfunktionen (som finns på de flesta sågar) är inkopplad. Kolla också att bladet står vertikalt – är det vinklad tenderar sågen att vandra i sidled. Slipar du ner spanten till linjen brukar det fungera genom att ribborna vbolar mot toppan på ojämnheterna. Har du "minusställen" som är bredare än ribborna kan du också kompensera genom att inte trycka ribban ända intill spantet just där, eller lägga ett tunt mellanlägg (kartong eller träkil) just där. Men med spant som inte riktigt stämmer blir det svårare att få ett korrekt format skrov och åtskilliga timmars extra slipjobb. Är följande antagande rätt. måttet mellan utsidan av spant 1 och spant 12 skall vara 11 gånger spantavståndet? Man blir naturligtvis hemmablind när man skriver och ritar och dessutom beskriver sin egen lösning – men jag förstår inte problemet. Bilden visar att spantmallen skall placeras så att inte skrovet får för mycket volym i stävarna och så att man ska slippa fasa varje spantmall så att den ansluter korrekt till bordläggningen – alltså ett mycket enkelt sätt att spara tid och jobb. Det handlar bara om att flytta spantmallarna en halv spanttjocklek i längsled. Det innebär att du placerar spantmallarna i förskeppet med sin förliga yta akter om den teoretiskta spantmarkeringen, och i akterskeppet framför densamma. Vilket i sin tur innebär att om du monterar läktbitarna med sin akterkant mot spantmarkeringen i förskeppet, och med sin förliga kant mot markeringen i aktersksppet så blir det rätt. Svårt att förklara med ord men väldigt lätt att visa och göra (därav bilden). Men det kan göras på många sätt. Följ beskrivningen eller hitta en egen variant (eller gör som vid traditionellt båtbygge: montera alla spant korrekt med centrum på spantmarkeringen och hyvla/slipa spantkanten så att den stämmer med vinkeln på bordläggningen). Det är resultatet som räknas..